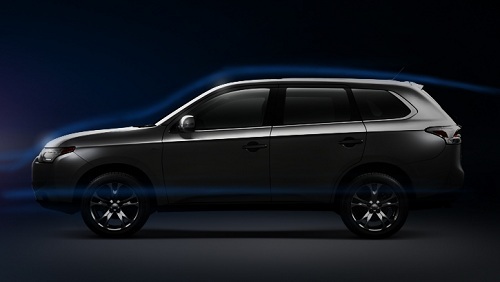 For 2014 Mitsubishi will take the Outlander up a notch. Intended by Mitsubishi to be a competitor to both the Subaru Outback, and the Toyota Highlander, the Outlander is a 7 passenger crossover with a number of different drivetrains. In 2014 a four cylinder, a six cylinder, and a plug-in hybrid are all on the options list. The Mitsubishi Outlander is almost exactly the same size as the previous generation Toyota Highlander. That is a good thing. It makes the rear two seats perfect for children, but doesn’t require that the vehicle be bigger than is really necessary to do the job well. The vehicle is a 5+2 as we say in the car business. In its current form the Outlander is a close competitor to the Outback and Highlander on paper. In dealer showrooms the story is dramatically different. Toyota sells more Highlanders each month in the US than Mitsubishi sells vehicles. Twice as many. Since Suzuki said sayonara last month, Mitsubishi has moved that much closer to being the smallest automaker in the United States. Looking ahead, the 2014 Mitsubishi Outlander is said to be coming in the form of a plug-in hybrid vehicle as well as a gasoline only vehicle. For the full report on that, please refer to our own Nicolas Zart’s preview here. Other changes to the model will include a refreshed face. Drivetrain improvements to both the gasoline engines will result in a slight bump in power and that combined with a weight reduction of about 200 pounds will increase fuel efficiency a bit, keeping the Outlander competitive in that area. Inside the defining feature of the 2014 Outlander Sport will be the “supa-bass” Rockford Fosgate sound system which features a subwoofer the size of a NASA satellite dish in the rear cargo compartment wall. The vehicle will also adapt to changing safety expectations and will offer forward collision mitigation along with all the other, now expected safety options such as blind spot monitoring. That a manufacturer this small can offer such features that were only launched in the last couple of years is more proof that to be special in the automobile business you really have to do something amazing.